On the surface No Blank Left Behind (formerly Blank This Game!) appears to be just another Cards Against Humanity clone with a few seemingly minor differences. First players have four statements/questions on each card to choose from. Second rather than be provided a hand of cards with a predefined responses, No Blank Left Behind instead utilizes whiteboards and dry erase markers allowing players to come up with their own responses, limited only by their individual imaginations. And lastly who wrote what answer is not kept a secrete from the judge or as it is know in No Blank Left Behind “The Dictator”. This allows players to lobby for their answer and explain why theirs is obviously the best. What does all this mean? Well, it means you should never have to ask a lame question. You are never stuck with answer cards that don’t fit the question. In-jokes or even the players themselves can become answers and the same answers can be used over and over leading to some very funny running jokes. Which in the end leads to a ton of laughs, many groans and possibly a few gasps. No Blank Left Behind may seem like another Cards Against Humanity clone, but the minor differences makes it a new unique and hilarious party game. No Blank Left Behind Is a game for 3-8 adults, but can handle even more with a second copy or by forming teams. Game length is adjustable, by increasing or decreasing the amount of cards dealt to each player at the start of the game. The average game plays in about 45-60 minutes. The suggested retail price is $30. Blank This Game! 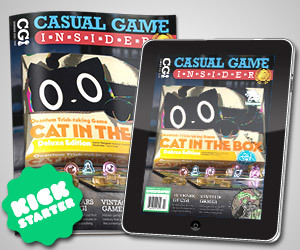 is live on Kickstarter from January 26th to February 28th. Despicable Games LLC is a new North American game publishing company focused on printing fun high quality games.